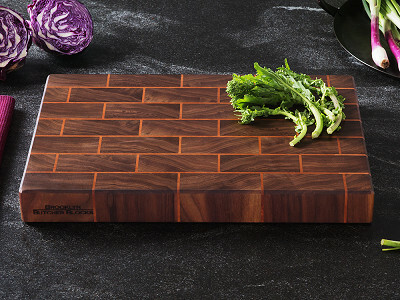 These beautifully crafted edge-grain, long-grain, and end-grain butcher blocks and knife blocks are made in Brooklyn, New York to last a lifetime. Brooklyn Butcher Blocks has been perfecting its formula since 2010. Maker Nils wanted to construct something so rugged that, with the proper care, could be passed down to the next generation and still look sleek. 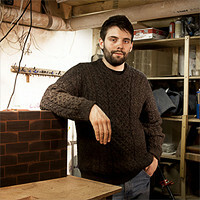 Nils's signature Brickwork Cutting Boards stagger stacked blocks so that each one is holding two others together, creating a solid brick wall of sorts. This strong bond reduces the odds of them splitting. Plus, it’s striking to look at. And even though these boards are made from natural wood, Nils wants to keep up with the times. Their tablet-holding edge-grain board has the same gorgeous, solid construction. 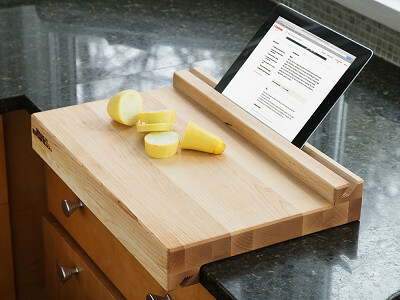 Let it hold your device for you, while you follow along with a recipe. 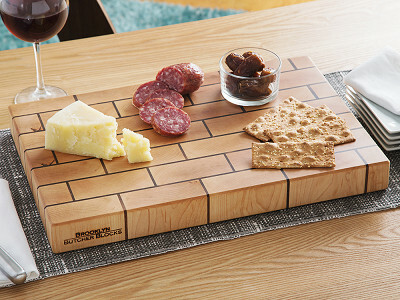 Whether you’re using an old fashioned cookbook, an iPad, or just your own improv dinner-making skills, these boards work wonders in the kitchen, and look great doing it. Hello everyone! I'm proud to introduce Brooklyn Butcher Blocks to The Grommet. I'd be happy to answer any questions you may have! How do you clean it/maintain it? And how would you remove stains from it? Thank you for asking! We recommend that you coat your board with *food grade* mineral oil every once 2 to 4 weeks for the first few months, at which point it'll develop a "cure" and you'll apply as is needed. 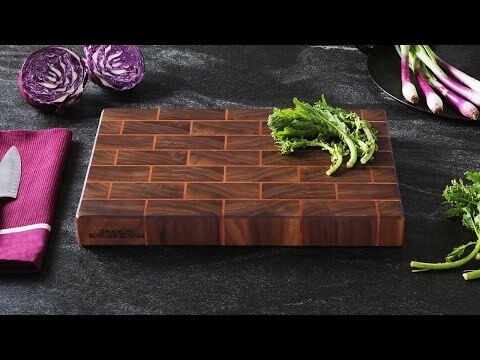 Cutting boards, however, always love more oil! Using a beeswax/oil mixture is also a viable option and is arguably more water repellant, though it won't "soak" into the board as much. To clean, wash with warm water and a cleaning solvent. Make sure to dry your board immediately. I leave mine upright on the counter so that way both sides are exposed to air and it dries evenly. Your options for cleaning solvents can vary--I recommend white vinegar (50/50 vinegar/water), but I have also used dish soap. Some complain that they can taste the soap in later meals, but I haven't had that issue. We do not recommend bleach... Oh, one last option--look to your butcher and you'll see that they leave lots of coarse salt on the board overnight. I haven't been brave enough to try, but I figure the pros know what they're doing. The best way to remove stains is to avoid staining. If it's too late, then the board needs sanding. For some items, sanding won't cut it and we'll need to resurface the board on our machinery and resand. A few past customers have found that wiping lemon juice helps eliminate stains. On the flip side, beats are the only things I've cut that has permanently stained a board. I haven't looked around to see who else has something like this but WOW. This is perfect. I cook for the week on the weekends and usually have my 2 cutting boards on the top of my flattop stove (limited counter space) and then my IPad is on the counter. That being said, would it fit against the edge of the stove like it does on the counter top? @Veronica It should, if you have a flat top or a classic gas top. It would probably be a better fit for a flat top than having it balance on the covers (or whathaveyou) of a gas stove. But that's just me! Is it heavy? I have arthritis in my hands and can't lift very heavy objects very well. 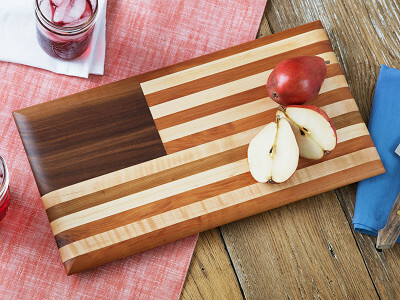 The walnut iBlock might be a good option if you're looking for something lighter, and the American Flag Boards are actually a really pleasure to pickup and lift. Light and nice ergonomic sides. I refer to it as a "pillow shape." afraid it is too heavy for my weak hands now. @Diane Quite welcome Diane! Thank you for posting your question. Have a good day. Can a disinfectant like Lysol with Hydrogen peroxide be used on the block? That's a good question, and you know... I don't really have an answer, so my safe answer would be a "no," however (if memory serves) white vinegar is also very effective. I'll try to do some research on this before end-of-day and get back to you with anything I find. What about cutting chicken on the board? Will vinegar kill the contaminants? Up above, I responded to Jessica about maintaining the piece. But yes, vinegar (I will actually use 100% vingar/no added water) will kill bacteria. Another method is leaving coarse salt overnight on a butcher block--a chosen method for butchers, but something I haven't been brave enough to try. We don't recommend bleach, however. 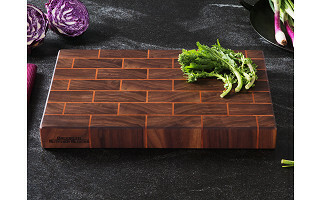 What is the material in between the blocks on the brick wall cutting board? @Paul wood! For the maple piece, we use walnut. For the walnut piece, we use cherry.